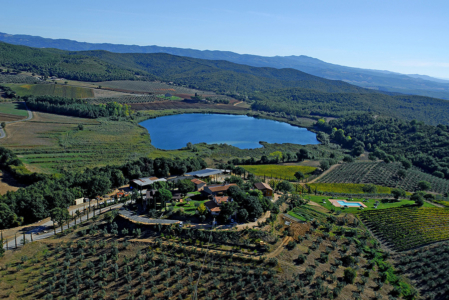 We are located only 400 metres from Lake Accesa, a marvellous pool of water which formed about 220 million years ago in a cavernous karst limestone depression. 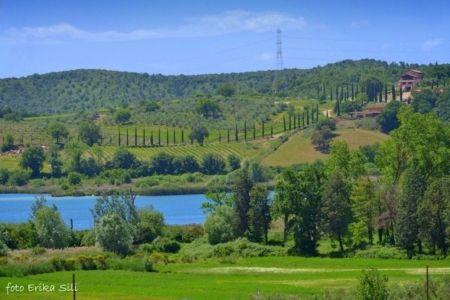 numerous fish species including carp, tench, pike, chub, perch, bleak, eels and trout, to the extent that the lake has been named a reserve by the Italian Sports Fishing Federation, while the luxuriant greenery around the lake is home to animal species typical of the Maremma district of Tuscany, such as wild boar, porcupine, badger, hare, fox and roe deer. The pristine nature of the environment is demonstrated by the presence of numerous species of amphibians, including the Italian green frog, the common toad and the emerald toad as well as the Hermann’s tortoise, an important tortoise species typically found in the area. Near the lake is an interesting archaeological park where recent excavations have brought to light an Etruscan settlement including the ruins of homes and a necropolis: the artefacts found in the dig are now on display in Massa Marittima Archaeological Museum. The archaeological park is located in a thick deciduous forest of oak, holm oak and manna ash, as well as other local flora including cork, rovella, laurel, mastic, erica, myrtle and rosemary. 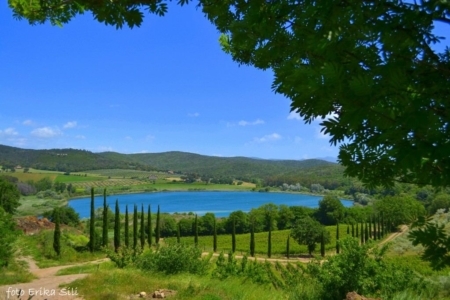 One of the most beautiful spots in the Maremma, it was in fact a chosen spot of the Etruscans, who were better than any other civilisation at choosing the most scenic spots for their settlements, in the 9th century B.C. its mineral-rich waters (sulphur, nitrates and phosphates) are not only perfectly clean but have restful, calming effects: our guests say they sleep much longer than usual here, especially after bathing in the lake. This could be caused by the virtues of the underground waters, or by the magic of the lake, with its wealth of legends. The morning air was soon filled with the frantic activity of people and animals: the men shouted out their orders, surrounded by the chaff that rose to cover them; the children ran about, carrying jugs of wine; and the women, in the big kitchen, plucked chickens for lunch. The scene was a merry one, and nobody seemed worried about going against the ancient traditional pact with the saint; there was almost an air of challenge about the scene, as the farmers had worked hard on the land and were about to collect the fruits of their labours. It was then that the air was rent by a terrible rumble, accompanied by shouts, screams and the pawing and whinnying of the animals, echoing darkly from hill to hill, until everything was swallowed up in a great abyss that had opened up in the bowels of the earth, before calm was restored and the greenish waters of a little lake sparkled in the sun on the same spot. (Per viottoli, sentieri e stradelli. Il lago dell’Accesa e dintorni, Follonica 2000). St. Ann’s behaviour allows us to recognise that here the mother of Mary in actual fact represents the earth goddess, she who oversaw work on the farm: Mater Matuta, Ceres, Demeter, powerful and vengeful, honoured and feared under a variety of names by all ancient peoples, from Etruscan to Italic, Greek and Latin. The legend might contain a fragment of a lost Etruscan story. Some say that on the night of July 26th, wailing and agitated voices, horses pawing the earth and bellowing oxen can still be heard around the lake. On the side of the lake closest to the farm holiday establishment there is a little beach where it is possible to bathe in the lake even if you can’t swim, while on the opposite site swimmers dive into the lake and race each other across it. Some say the lake is 40 metres deep at its deepest point, but the lake bottom is covered with branches, hindering precise measurement of its depth.